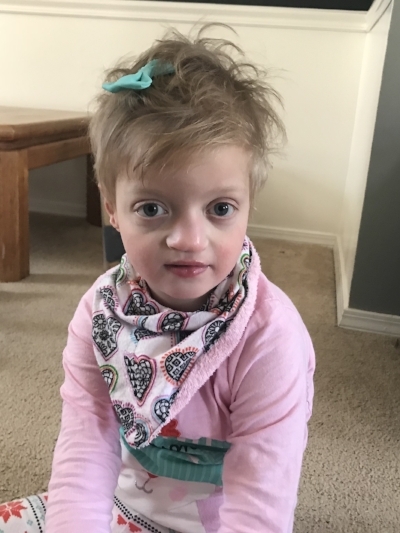 When Elsa gets in a rhythm of scan-scan-scan (hitting the red button repeatedly), her therapists say, "Not to worry." This is much like a baby saying, "Ba, ba, ba." Repetition and practice are how we learn language. While Elsa's style of speaking is different, "babbling" is expected and encouraged. 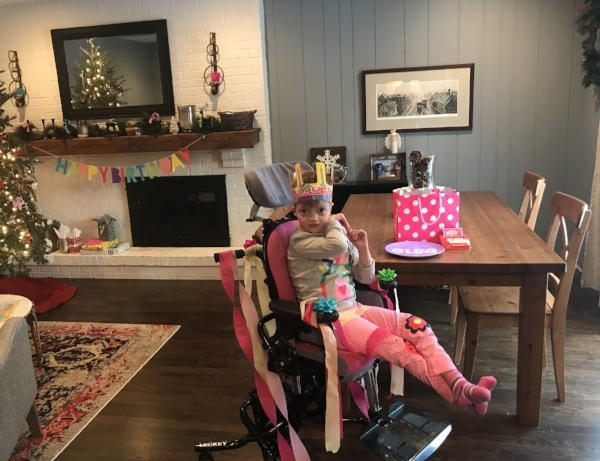 Since Elsa outgrew her stander, this poor West Elm chair has been getting a workout. 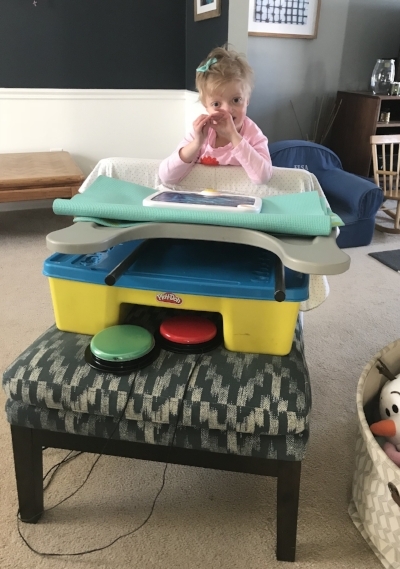 It's at a good height for her to lean up against it, and if we stack things just-so, we can set up an activity/talker station for her to use, until she gets tired. When that happens, it's back to the chair. 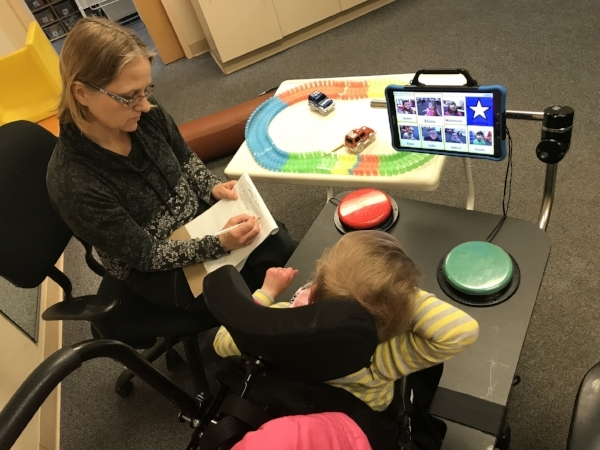 The major reality in this talker-trial adventure isn't lost on us: We are incredibly blessed to live in a time and place where Elsa has access to these technologies and to therapists who've devoted their lives to helping kids express themselves in a verbal world. We'll keep you posted on how the trials go, and how her talker use progresses. It's so exciting to see how engaged she is to use the device. I am certain that SHE knows that this is her communication tool. She's energized to figure it out (and her sisters are too). 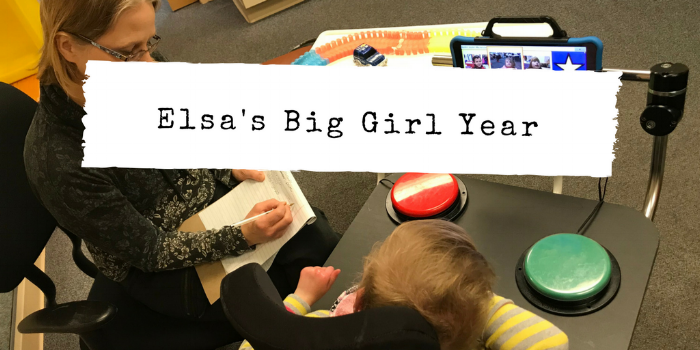 Yep, I think this is gonna be a big-girl year for our blue-eyed girl.